Aim: The aim of the study was to evaluate the efficiency of dental students and new graduates of College of Dentistry, King Saud University, in Riyadh, Saudi Arabia, to select the appropriate methods of restoring endodontically treated posterior teeth (ETPT) at different conditions of remaining sound tooth structure. Materials and Methods: A questionnaire was distributed among the 4th- and 5th-year dental students and new graduates. Respondents were requested to indicate their gender and level of education and to select the preferred restoration of ETPT at different conditions. Results were analyzed using one-way frequency and two-way cross-tabulations. Results: At >50% tooth remaining (condition A), 39.9% of the respondents preferred to use an amalgam restoration, while 30.9% preferred to use a restoration followed by a crown at 50% of remaining tooth (condition B). At <50% tooth remaining (condition C), 74.6% preferred to use a cast post-and-core and a crown. Respondents changed their choices of restoration to more advanced ones when teeth served as abutments for fixed or removable prostheses. Chi-square analysis demonstrated a statistically significant relationship between the selected restorative method at condition A and both gender (P = 0.045) and level of education (P = 0.001), between the method of restoration at condition B and both the gender (P = 0.000) and the level of education (P = 0.003), and between the selected restorative method at condition C and the level of education (P = 0.000). Conclusions: Respondents demonstrated a high knowledge when selecting the appropriate method of restoring ETPT at different clinical conditions. 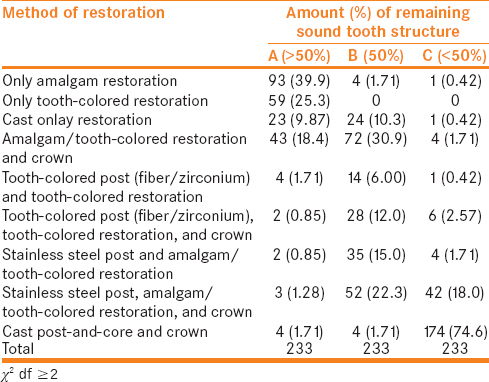 Results showed that 39.9% of the respondents preferred to use only an amalgam restoration and 25.3% selected to use a tooth-colored restoration [Table 1]. Female (47.1%) and 4th-year students (56.4%) preferred to use an amalgam restoration, while male (28.7%) and 5th-year students (33.3%) preferred to use a tooth-colored restoration [Table 2] and [Table 3]. Chi-square analysis demonstrated a statistically significant relationship between the selected restorative method and gender (P = 0.045) and level of education (P = 0.001). 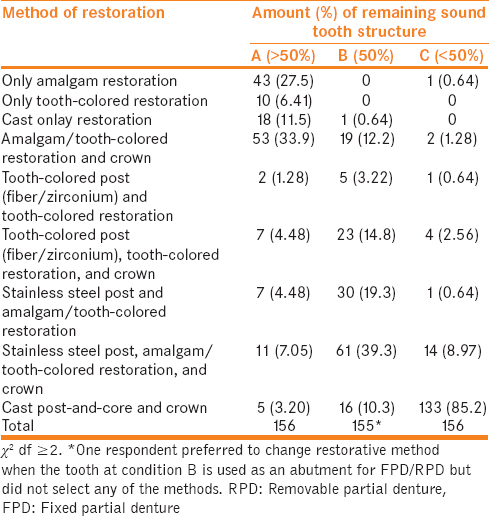 When the same tooth is to be used as an abutment for an FPD/RPD, respondents preferred to restore it with amalgam/tooth-colored restorations followed by crown restorations (33.9%) [Table 4]. This method was preferred more by male (36.8%) and 4th- and 5th-year students (33.8% and 39.3%, respectively) [Table 5] and [Table 6]. Chi-square analysis demonstrated a statistically significant relationship only between the selected restorative method and the level of education only when the tooth is to be used as an abutment for FPD/RPD (P = 0.015). Vârlan C, Dimitriu B, Vârlan V, Bodnar D, Suciu I. Current opinions concerning the restoration of endodontically treated teeth: Basic principles. J Med Life 2009;2:165-72. Gonzaga CC, de Campos EA, Barato-Filho F. Restoration of endodontically treated teeth. Rev Sul-Bras Odontol 2011;8:33-46. Wu Y, Cathro P, Marino V. Fracture resistance and pattern of the upper premolars with obturated canals and restored endodontic occlusal access cavities. J Biomed Res 2010;24:474-8. Pradeep P, Kumar VS, Bantwal SR, Gulati GS. Fracture strength of endodontically treated premolars: An in vitro evaluation. J Int Oral Health 2013;5:9-17. Meyenberg K. The ideal restoration of endodontically treated teeth – Structural and esthetic considerations: A review of the literature and clinical guidelines for the restorative clinician. Eur J Esthet Dent 2013;8:238-68. Goga R, Purton DG. The use of endodontically treated teeth as abutments for crowns, fixed partial dentures, or removable partial dentures: A literature review. Quintessence Int 2007;38:e106-11. Schiavetti R, Sannino G. In vitro evaluation of ferrule effect and depth of post insertion on fracture resistance of fiber posts. Comput Math Methods Med 2012;2012:816481. Spielman H, Schaffer SB, Cohen MG, Wu H, Vena DA, Collie D, et al. Restorative outcomes for endodontically treated teeth in the practitioners engaged in applied research and learning network. J Am Dent Assoc 2012;143:746-55. Manda M, Galanis C, Venetsanos D, Provatidis C, Koidis P. The effect of select pulp cavity conditions on stress field development in distal abutments in two types of fixed dental prostheses. Int J Prosthodont 2011;24:118-26. Eraslan Ö, Eraslan O, Eskitaşcıoğlu G, Belli S. Conservative restoration of severely damaged endodontically treated premolar teeth: A FEM study. Clin Oral Investig 2011;15:403-8. Zicari F, Van Meerbeek B, Debels E, Lesaffre E, Naert I. An up to 3-year controlled clinical trial comparing the outcome of glass fiber posts and composite cores with gold alloy-based posts and cores for the restoration of endodontically treated teeth. Int J Prosthodont 2011;24:363-72. Baba NZ, Golden G, Goodacre CJ. Nonmetallic prefabricated dowels: A review of compositions, properties, laboratory, and clinical test results. J Prosthodont 2009;18:527-36. Meshram P, Kamra AI, Meshram V. Reinforcement effect of polyethylene fiber in root-filled mandibular molar: An in vitro comparative evaluation of two different techniques of placement. Ann Essences Dent 2010;2:17-22. Khullar P, Raisingani D, Gupta S, Khatri RK. A survey report on effect of root canal fillings and coronal restorations on the periapical status of endodontically treated teeth in a selected group of population. Int J Clin Pediatr Dent 2013;6:89-94. Al Shareef A, Abdelhamied S. Endodontic therapy and restorative rehabilitation versus extraction and implant replacement. Saudi Endod J 2013;3:107-13.